It happens every year. But sometimes, it really, really happens. Tarnished plant bugs, a perennial pest for Arkansas cotton growers, are showing up in the state’s cotton fields in quantities that have caught the attention of entomologists who have seen nearly everything. “It’s the worst we’ve seen in years,” said Gus Lorenz, Extension entomologist for the University of Arkansas System Division of Agriculture. The insects, which are brown with small patches of white as adults and light green with black dots as nymphs, tend to feed on both the squares and bolls of the cotton plant, often resulting in direct yield loss for the grower, or shriveled, off-color blooms. 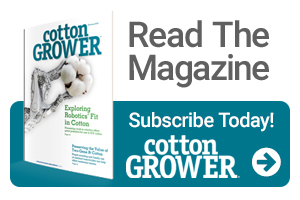 The established control threshold – the point at which it becomes more economically feasibly to control a pest through insecticides or other means, rather than ignore it – for tarnished plant bugs in cotton is three total plant bugs per 5 row feet. Nick Bateman, Assistant Professor of Entomology for the Division of Agriculture, said some cotton plots in the Marianna area have yielded as many as 40-50 adult plant bugs per 10 row feet – perhaps seven to nine times the established control threshold. While insect pressure in general has been high throughout Arkansas this year, Bateman said the presence of tarnished plant bugs seems to be particularly pronounced in cotton fields bordered by corn. Craighead County, which had the second largest cotton acreage and fifth largest corn acreage in the state in 2017, has served as a clear example of this phenomenon in 2018. Branon Thiesse, staff chair for the Craighead County Cooperative Extension Service office, said many cotton growers in his county have already made at least two insecticide applications in an effort to control tarnished plant bugs. “They were rushing around, trying to spray them again before we got the rain on Sunday,” Thiesse said. While the relatively cold winter Arkansas experienced in late 2017 and early 2018 helped reduce the populations of many exotic pests such as the red banded stink bug, tarnished plant bugs are native. Bateman said that the sustained low temperatures may have actually reduced populations of beneficial insects, including those that would typically help control tarnished plant bug populations. Ryan McGeeney is a communications specialist with the University of Arkansas Division of Agriculture Cooperative Extension Service. See all author stories here.